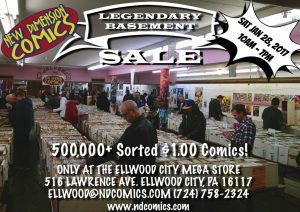 Only 3 times a year do we open the basement in Ellwood. Don’t miss you chance to come and show over 500,000 sorted comics, all for just $1 each! Long box special! Fill a long box for $250! All books must be facing the same direction from front to back, nothing laying down, nothing down the sides. Long boxes provided. ← Countdown to the Holidays Sale Event! Dec 12-14th! All locations!